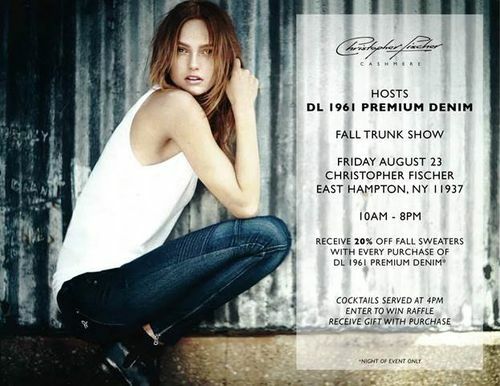 Christopher Fischer Cashmere Hosts DL1961 Premium Denim Fall Trunk Show at Christopher Fischer Southampton. 10:00 pm-8:00pm. Cocktails served at 4:00 pm. Receive 30% off ALL purchases of DL 1961 Premium Denim. As a part of the DL1961 Premium Denim Trunk Show, guests are invited to preview and place orders from their upcoming fall collection. Part of the event will include a “Try ‘Em and Buy ‘Em Program,” which enters every customer who tries on a pair of DL1961 jeans into a raffle for a $50 Christopher Fischer gift card, and enters every customer who buys a pair of DL1961 Premium Denim jeans into a raffle for a $100 Christopher Fischer gift card. In addition to previewing DL1961’s newest designs, customers will also have the opportunity to preview and purchase Christopher Fischer’s Fall 2013 men’s, women’s and baby collections. Each Christopher Fischer sweater purchased along with a DL1961 piece at the trunk show will be discounted by an additional 20-percent off the original ticketed price.